It’s Jason with Carltonaut’s Travel Tips. Since I was a kid, my family has taken an annual vacation to Escalante, Utah, located along Utah’s Scenic Byway 12. As a kid, our trip consisted of fishing, camping, hiking and watching an amazing small-town Pioneer Day parade in July. Now that I’m older, I enjoy taking my kids on adventures that span from Panguitch to Boulder. The route is not only scenic, but if you know where to stop, you’ll be able to have a lot of family adventures in some of the world’s most beautiful country. Here are 7 stops for a fun family road trip on Utah’s Scenic Byway 12. If you’ve ever wondered where the engineers of Big Thunder Mountain in Disneyland got their inspiration, wonder no more. A drive through Red Canyon makes you feel like you’re looking at the formations of the roller coaster. In fact, Red Canyon has Thunder Mountain Trail. So it’s the perfect stop for any Disney fan. As a kid, we never stopped in Red Canyon – except to take the obligatory photo in front of one of the two small tunnels. As an adult, I’ve spotted a bike path alongside the road and am determined to get down there with my wife to take a ride. You can spend a few minutes in the Visitor Center to learn more about the geology and features of the area. You can decide which trail you want to take if you’re looking for a hike. Or you can simply grab a quick souvenir and hop back in the car. But if Red Canyon looks this cool from the roadway, imagine how spectacular it would look as you explore it along a trail. There is no cost to stop and explore Red Canyon. Visitor Center: There are a few reasons to start at the Visitor Center. First, you can talk to a Ranger about the trail you want to take. They can offer some great advice. The other, almost more important reason to stop: You can fill up all your water bottles. Bryce Canyon is hot, and if you don’t have adequate water with you as you’re exploring, you may find yourself in trouble. Rim Trail: Park near Sunrise Point and make your way south along the Rim Trail. There are great views of the orange and red rocks scattered below. You can hike the Rim Trail as far as you want to go. It does reach Sunset Point, so if you want to hike from Sunrise Point to Sunset Point, then take the Navajo Loop Trail, you can. Navajo Loop Trail: Park at Sunset Point and make your way to the trailhead. You can start the Navajo Loop Trail one of two ways: hiking down some switchbacks toward wall street; or starting with a view of Thor’s Hammer. The advantage to starting with the steep switchbacks is that you don’t have to hike them at the end of your hike along the loop. There are lots of families who take the hike, so it’s okay for kids and adults. There is a National Park entrance fee for Bryce Canyon National Park – $35 per vehicle. If you plan to visit multiple national parks, you should consider buying an National Parks Annual Pass. Kodachrome Basin State Park makes for an excellent day trip along Utah’s Scenic Byway 12. There are multiple trails, each one offering spectacular views of the colorful cliffs, sandpipes, box canyons and more. One trail that brings you through some of the most spectacular scenery is the 2.9-mile Panorama Trail. You can also keep an eye out for lizards, birds, scorpions and other wildlife. If you want to spend more time at the park, you can grab a campsite in the full-service campground. One interesting fact about the park: The National Geographic Society Expedition named the park in honor of the then revolutionary Kodak film. There’s also a song by Paul Simon, Kodachrome, that is bound to get stuck in your head as you explore the park. There is an entrance fee to visit the park – $8 per vehicle. You can purchase a Utah State Parks annual day pass if you plan to visit any one of the 40+ Utah State Parks. Three of them are easily accessible from Utah’s Scenic Byway 12. The forest may be petrified, but you shouldn’t be scared.The Escalante Petrified Forest State Park may be small, but it offers a full-service campground, access to a reservoir (if you like boating, kayaking, swimming or fishing), and hiking. If hiking’s your thing, stop in the Visitor Center and grab a Nature Trail Guide before heading up the roughly one-mile trail. There’s adequate parking at the trailhead. Along the trail, there are signs with numbers on them that coincide with numbers in the guide. You can learn about foliage, rock formations, minerals and of course, petrified wood. The trail offers a great view of the city of Escalante and Wide Hollow Reservoir below. Petrified wood are fossilized trees from millions of years ago. While they look like rocks from a distance, as you get closer you can see the features of the wood. The colors in the petrified wood are amazing and unique. Along the trail, you’ll find logs that have been petrified and laying there for you to look at. Keep in mind, it’s illegal to take petrified wood from the state park. There is an entrance fee to the Escalante Petrified Forest State Park – $8 per vehicle. An hour in the Devil’s Garden is sure to entertain the kiddos. There are no hiking trails, but rather rock formations that are longing to be explored. You’ll find Metate Arch and a few hoodoos in the garden. It’s the perfect stop for a picnic lunch or to let the kids get their wiggles out. The Devil’s Garden is 12 miles down Hole in the Rock road, a short drive off of Utah’s Scenic Byway 12. The road is dirt, but well managed in the summer months. So almost any vehicle can make the drive. There is no fee to enter the Devil’s Garden. A very popular spot, especially following the Pioneer Day parade in Escalante, the Calf Creek Recreation Area is a fun water stop. There are 13 campsites, which are all first-come, first-served. They are located along the creek. But if you’re just planning to stop over for some fun, that’s okay, too. Calf Creek is a shallow creek that can easily be explored. Near the campground, a small dam has been built to provide a shallow pool of water for people wanting to immerse themselves in the water. Otherwise, the creek is about one foot deep, making it the equivalent of a splash pad – without the water spouts. Water shoes are great to have, but not required. If you’re in the mood for a hike, the 6-mile roundtrip moderately strenuous hike to Calf Creek Falls is a must do. The falls are iconic to the Grand Staircase-Escalante National Monument and one you won’t regret doing. Just be sure to bring a lot of water with you. The last thing you need it to end up dehydrated along a trail in the middle of summer. There is a $15 fee for camping, but I’ve also been charged a day-use fee when I’ve been down there around the 24th of July holiday. The Anasazi State Park Museum is another quick stop along Utah’s Scenic Byway 12. You’ll find a museum with artifacts, interactive exhibits and information about the Anasazi people who once lived in the area. Just behind the visitor center is a replica of a native American dwelling. There are multiple rooms to explore, but if you’re tall, you’ll likely be hunched over. The ceilings aren’t very high. After exploring the dwelling, you can venture along the path and see the foundation footprints of the small village that was built here in Boulder, Utah. The inhabitants burnt the dwellings when they abandoned it in about 1175 A.D. The pit house they have there as well is neat to see. If you’re interested in having your kids do the Junior Ranger Program at the museum, be sure and ask for the booklet at the front desk. There is an entrance fee to the Anasazi State Park Museum – $10 for a family. 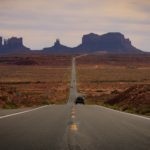 A roadtrip along Utah’s Scenic Byway 12 can be a single day trip with a few stops, or you can turn it into a few days and really get a taste for the beauty Utah’s wilderness has to offer.